The former front man and X Factor judge told Jonathan Ross it was his "dream" to reunite all five members of the band. He claimed he was in touch with Williams "all the time, nearly every day" and that the band would sit down in January to decide whether he would record with them. He said: "I'm hoping for five. I mean, it's usually diaries and stuff, but I'm hoping to have Rob with us. "Rob's a big emailer. He loves emailing, block capitals. I hear from him a lot. He's a dad. He's in London at the moment, promoting his new record. He's in a great place. "I always say to people, that Rob I didn't know for 10 years. I didn't know him because I was just reading things through the press. But I know a really good Rob right now. So I've got a good end of the deal. "For us, that's always the dream, to have five." Williams helped with the band's sixth studio album, Progress, in 2010 - the first time he sang with them since being asked to leave in 1995. 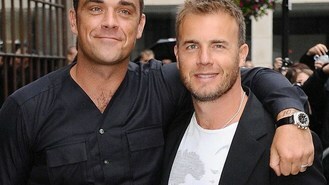 Barlow, 42, also recalled recording his duet with Williams's friend Elton John for his upcoming solo album Since I Saw You Last. He said: "It was so sweet to see him reach in his bag and pull out his iPad and start showing us all pictures of the kids, and he was so proud." "It just goes to show, no matter who it is, kids change people. And he was besotted by his children. It's beautiful." The singer recently played a gig for troops in Camp Bastion in Helmand, Afghanistan, saying he "didn't feel endanger at all" - even after the first half was cancelled by a sandstorm and a security alert. He told Ross: "Once I was there I felt completely safe, and the morale on the camp is amazing. The gig was incredible." Barlow's interview will be broadcast on ITV1 at 10:30pm tonight.